As a teenager, I felt all giddy whenever I got new makeup -- I couldn't wait to try the newest cosmetic brands and make my friends a tad envious. Of course, I didn't know it then, but every time I washed the makeup off my face, I was participating in a vast system of global environmental pollution. As a teenager, I felt all giddy whenever I got new makeup -- I couldn't wait to try the newest cosmetic brands and make my friends a tad envious. Of course, I didn't know it then, but every time I washed the makeup off my face, I was participating in a vast system of global environmental pollution. I was literally dumping ecologically toxic chemicals into the planet's oceans and rivers. More than a decade has passed since. And now there is a large volume of research on the ingredients commonly found in makeup products -- and how they impact the environment. It's something that many otherwise socially conscious women don't know, but certainly should: makeup products are filled with synthetic chemicals that, when wiped from your face, steadily make their way to the ocean. The end result? Chemical pollutants hit marine wildlife hard, contributing to the overall problem of species extinction and environmental destruction. But exactly what toxic chemicals do many makeups contain? Well, one of the big offenders has been very tiny plastic particles that are often called "microbeads." Microbeads are usually made from the chemical polyethylene, and have been advertised as a new technology that allows for gentle skin exfoliation. Naturally, the marketing behind microbeads didn't mention the appalling damage they cause to the environment. To put this into perspective, experiments have shown that in some shower gels, there is actually as much microbead plastic in the gel as there is plastic in the bottle container. This is rather disturbing; it means that using typical makeups can amount to throwing plastic bottles into the ocean. More must be done to raise awareness of the dangerous chemicals in makeup products such as eye shadow, blush powders, makeup foundation, nail polish, mascara and eyelash adhesives. Fortunately, both Canada and the United States have taken the bold step of banning microbeads from numerous cosmetic products. However, beauty products with microbeads can still be easily purchased through online shops like Amazon.com, where there's currently a microbead-based face cleanser with more than 430 customer reviews. So while legislation helps the situation a bit, more must be done to raise awareness of the dangerous chemicals in makeup products such as eye shadow, blush powders, makeup foundation, nail polish, mascara and eyelash adhesives. Titanium dioxide (TiO2) -- usually comes in the form of nanoparticles; you'll find this chemical in skin tints, mineral-based makeups and a wide range of other cosmetic products like sunscreens. Titanium dioxide causes DNA damage to freshwater snails and stops phytoplankton from growing. Given that phytoplankton is responsible for producing roughly two-thirds of the Earth's atmospheric oxygen, the decreased growth of phytoplankton means many fish -- and other ocean life -- will suffocate and die. And it's not just marine wildlife that will suffer, either. Humans and animals, too, will find it more difficult to breathe as atmospheric oxygen levels are depleted. Paraben -- a chemical preservative found in most cosmetics to stifle the growth of bacteria. There is some evidence that paraben is partially at fault for killing off coral, and more than a few scientists believe that this chemical is a hormone disruptor in dolphins and other marine wildlife. What is particularly worrying about paraben is that there is a swelling stack of scientific evidence that parabens have been accumulating in the tissues of marine organisms, bears, and birds -- which shows us that this environmental contaminant actually works its way from our sink water into the bodies of animals. Triclosan -- it's another anti-microbial agent used in makeup powders and skin care products. It also happens to be an endocrine disruptor that has been found in alarming quantities in the Great Lakes and reduces the lifespan of freshwater organisms. 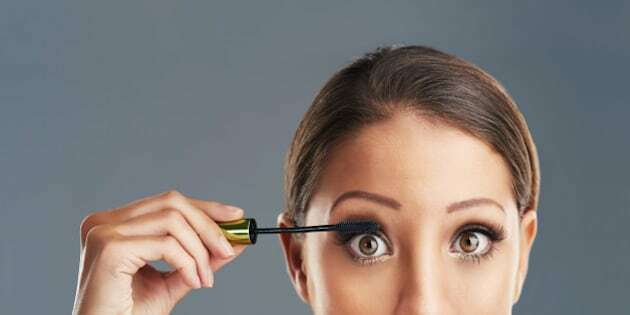 In short, two decades' worth of environmental and toxicological research has consistently shown that the synthetic ingredients in makeup pollute the environment and disrupt ecosystems. So does this mean you should sacrifice your love of makeup for the good of the environment? Or that you'll be sporting a makeup-free look from now on? Happily, the answer to these questions is a resounding "No!" There are excellent brands that have made it their mission to create completely natural makeup that have only organic, vegetarian ingredients. For example, Lush has several makeup products with only natural ingredients, and True Glue's flagship product is an all-natural lash glue. The environmental harm caused by synthetic makeup ingredients is not something I seriously considered as a young girl eager to try the hottest makeup brands. But now that there is much more evidence-based research out there, it's my millennial generation's turn to make the right, socially responsible choices. So next time you're putting on your makeup, pause and think about what it really means for life on our little blue planet.